If we can do it, pretty much anyone with basic sewing skills can! We’ve made 2 of these now, and both took about 2 hours. If you’re using 5 different fabrics, you’ll need 1/3 yd (12″ l) of each (assuming the fabric is 45″ w). That will be more than enough so that you can trim them down to the exact size you need. For backing, you’ll need 36″ w x 50″ l piece, but we suggest getting a little more than that and trimming down. So let’s say 1 1/2″yd (54 in”). You’ll need the same amount in batting. 1. 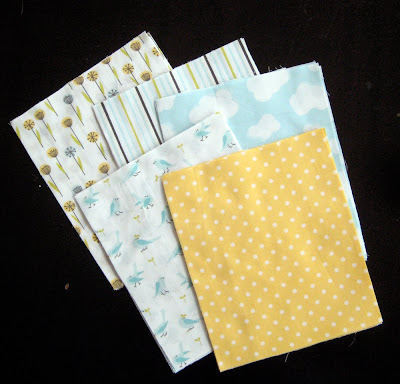 Cut your swatches: 5 swatches from 5 fabrics (25 swatches total), each measuring 10″h x 7.5″w. 2. Lay out your swatches so that each pattern is represented only once in both the horizontal and vertical rows. 3. 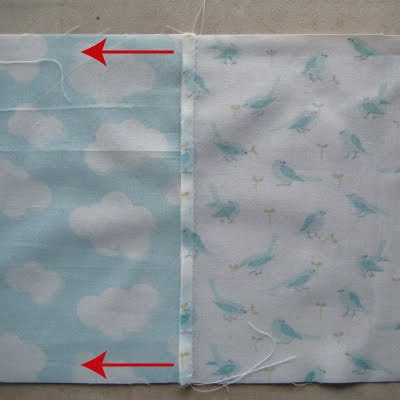 Starting in the top left and working your way across, stitch pieces together using a 1/4″ seam allowance to create a horizontal strip. When finished, turn over and press the seams to the LEFT. Repeat to complete all the horizontal rows. 4. 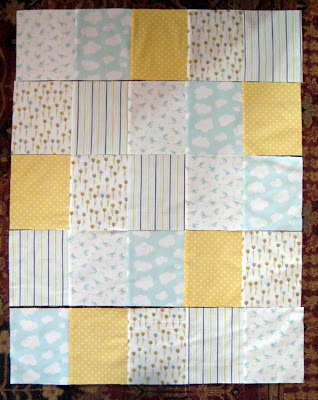 Pin the top row to the 2nd row, aligning all seams, then stitch. Continue until all rows are stitched. When finished, turn over and press all the seams DOWN. 5. On a flat surface lay out and smooth down a 38″w x 50″h piece of cotton batting. I used a thin organic cotton batting. On top of that, lay out and smooth down a 38″w x 50″ cut of the backing fabric FACE UP. On top of that, lay out and smooth out the quilt topper FACE DOWN. 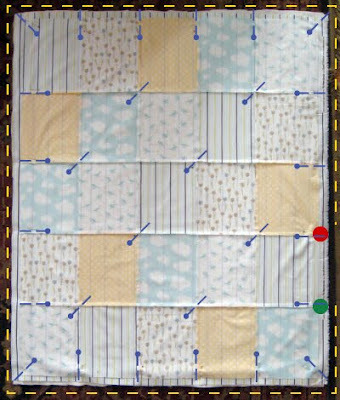 Starting in the center of the quilt and working your way out, pin as shown in the image below. 5a. Stitch 1/4″ from edge of the quilt topper beginning at the green dot and work your way around to the red dot. *be sure to back tack at the start and finish. * This will create a small opening, through which you can turn your quilt inside out. 5b. 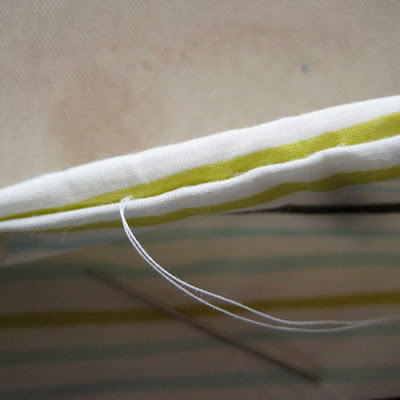 Before turning inside out, after stitching, trim the excess seams to be flush with the quilt topper (1/4″ from seam). 6. After turning the quilt inside out through the opening, flatten the seams with your fingers and press, making sure that from the top side, you do not see the backing fabric. 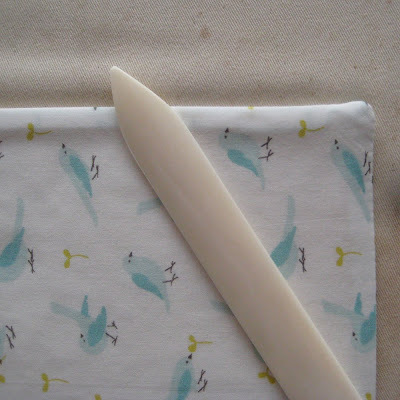 Use a tool such as a bone folder or a pencil to push out the corners neatly. As you press, pin along the edges to keep your fold in place. 7. When you come to the opening, you will need to press the edges in and pin closed. Hand stitch the opening so that it is closed. 8. Lay out the quilt again and smooth it out so that all layers are evenly distributed. Starting in center and working outwards, pin through all thicknesses at every seam intersection as shown below. 9. Topstitch 1/4″ along the entire edge of the quilt. Topstitch 1/8″ to the RIGHT of each VERTICAL seam. Finally, topstitch 1/8″ BELOW each HORIZONTAL seam. I’ve been wanting to do a quilt like this…does this quilt come out as a certain ‘size?’ — is this considered a lapquilt? I just found this tutorial and I have never quilted. I thought this would be a good place to start. Did you ever find out the size and did you make it? Thanks, I am going to be a grandma in May and I want to make a quilt for my grandson. Taking the seems into consideration the finished size would be 35 by 47.5; a good sized baby blanket. Thank you for the great tutorial. I have only had my sewing machine about 3 weeks. This is my first quilt project and the simple steps have made it easy for a beginner to follow. But, why would I want a quilt so small? Have you tried washing this? Does it do ok in the machine – the batting doesn’t roll up inside? Thanks! I love the fabric you chose! My grandma taught me to use embroidery floss to attach the front of the quilt to the backing. 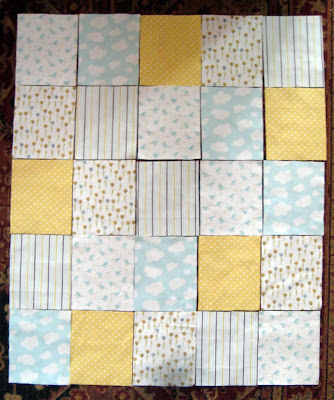 I do every other quilt block on each row, which works well keeping the front, batting and back of the quilt together. I have been making quilts for over 30 years this way with no problems, and they go in the washing machine just fine. The quilt washes fine. The top stitching holds everything in place. Use old blankets for battng. They won’t bunch or shift and you can usually find the cheap at yard sales and thrift stores. Using the measurements given(5 squares at 10″ each minus 3″ for seams by 5 squares wide times 7.5″ each minus 3″ for seams )makes it 47″ long 34.5″ (approximately). Thats a good baby sized quilt. 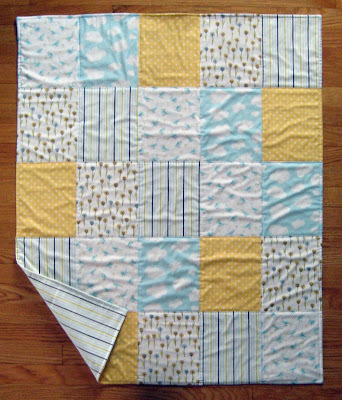 Most baby quilts are 42.5″ by 54.5″ but that is very big. Love it thank you! Perfect for charity use too. I’m enjoying making this for my nephew’s new baby boy, Benjamin. THANK YOU!! I’ve made three of these so far. It’s such a great pattern! Thanks for sharing. I bought a sewing machine today and this was the first quilt I made with it! Easy to follow instructions for a beginner. Thank you for sharing! Why do you turn the quilt wrong side out? There is no binding on this quilt. This process finishes the edge. How does the batting hold up while turning it inside out? That part confuses me. It works perfectly. I have made numerous quilts this way, and not just this pattern. Can you make the quilt bigger by just adding squares? I very new to this and wanted to make my 10 year daughter a quilt to wrap up in. Thank you so much, I so excited about this pattern!!! Sure- just add another to a row and/or column. The only thing is you will likely need to increase your backing fabric which probably means you will need to piece that together. How do I maintain the pattern if I want to make this quilt larger? Do i repeat an existing fabric or add new? How does the batting hold up while you turn the blanket right side out? Also did you tie the blanket so it wont bunch up? The batting held up fine in turning – we were careful, but it’s not as fussy as you might think. It is quilted along the seam lines which keeps the batting in place. This may be a silly question (I’m a total newbie), but do I need to use a quilting needle, or do I just use the all purpose needle? Regular sewing machine needles are used for this. Instead of topstitching, could you use a “tie” method at each intersection of the squares? Absolutely! I think we did this in another version of the quilt. I made a no sew quilt and am having trouble with the tying of the fabric in the middle. I used a tapestry needle to sew the fabric through all 3 layers, but I couldn’t get the needle through with the strip of fabric I was using. Can anyone suggest a tip or two on how I can hold all this together without actually sewing on a machine? Is there a certain type of needle I should be using? i love how simple your tutorial is and love your colors. I love how simple your tutorial is. I also love your color choices. It been a little while since I’ve made one but I tailor tack in between the intersection of each block instead of top stitching. I just finished my first quilt, but it had a binding on it. I would have liked to start on an easier one like this one. I will make this quilt next. Thank you for your tutorial. I love the simplicity of it. I think it would take me more than 2 hours, It takes me a long time to figure out what fabric to use. I am so trying this. Thanks. I made this quilt and it did take me longer than 2 hours, but it was easy and your instructions were great! I’m at the final step of top stitching, and I cannot make it to the end of the first column without my fabric bunching up on me in the last 2-3 rectangles. I’ve ripped out the stitching twice now. I’ve pinned it as instructed. I don’t know what I’m doing wrong. Any suggestions? Thank you. It would really help to use a walking foot if you have one. This feeds the top & bottom fabrics thru more evenly. if you don’t have a walking foot you really need to have a good grip on the fabrics. I use one hand to grip the top of the fabric as it’s coming through the stitch and use the other hand to grip the fabric before it goes through. You need to keep the fabric moving steady. I sort of use my top hand to gently pull the fabric at a steady pace. It works. I totally agree. Every quilter should have a walking foot in their attachment box.! 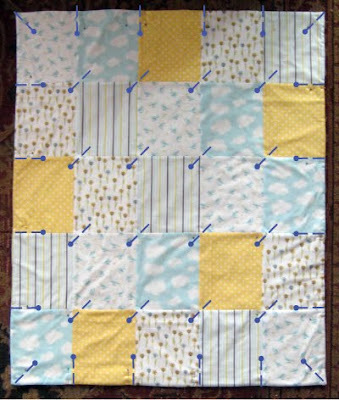 I love the simplicity of this baby quilt. I have made quilts before and I have a new granddaughter coming in September. I will try this with the charm packets that I bought. Thanks alot. This quilt turned out beautiful! I’m a novice but you’d never know it by looking at this quilt! Thank you for the easy to follow instructions! Thanks so much! I just completed this quilt and it’s fantastic. Perfect for a baby shower gift for my friend. 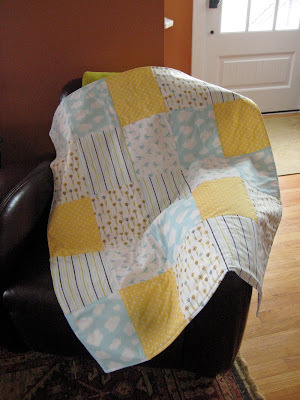 I have made two of these quilts and they are so easy peasy and make such a lovely baby quilt. This may sound silly, but what did you do with the pins you put in, and when did you take them out? What type fabric did you use? Great tut! Thanks for such easy to follow directions. This was my first attempt at a quilt of any kind. It turned out beautifully and was the perfect gift. Now I have the quilting bug! Thank you for the clear tutorial. I just finished a quilt for my granddaughter. I’ve only made rag quilts before and this being my first quilt where I needed to be more precise, I didn’t want to have to worry about the binding. I made the quilt a little larger, 7 squares by 8 squares. I’ll be giving it to her with a book and a mug for hot chocolate. EASY TO FOLLOW INSTRUCTIONS! THANK YOU SO MUCH! I AM ALSO A FIRST TIME QUILTER AND GRANDMA. I’m 83 and have been away from sewing for many years. I made quilt tops when I was in high school, but never finished them. My Mom did that. She left 6 quilt tops for my kids. The 4 girls got theirs, and the only one left has a lot of orange in it. Besides which they were all double bed size, and my son has what’s called a “California King”. So, I think I’m going to start from scratch in making him one, and I like this pattern. It’s simple, bright, and will be easy to make the size he needs. My Mom and I “collected” material for a long time, looking forward to making quilts after I retired. Well, she didn’t make it. She passed away unexpectedly in 1984, and I was diagnosed with Rheumatoid arthritis in 1985 and I’m just now getting into the ‘mood’ to do anything with all that fabric. May have to buy some new — depending on what I need. To start with, it’s going to be really simple patterns. Sorry this is so long. Thanks for sharing this quilt pattern! love it:) I have a new grandson and would love to give this a try for him. I was wondering if you could use flannel instead of cotton? Thanks again for sharing! Hi. Is there no.batting in this quilt? Yes, there is a layer of batting. Please refer to the layering directions. How many fat quarters would you need for each of the fabrics? You need 1/3 yd of each fabric. Love the quilt. Your tutorial seems great. Can’t wait to try it. Would flannel be o.k. to use? I love flannel for all my baby blankets and burb rags. Thanks again! This is a great project for flannel. Will obviously be thicker and more plush.